During the event, the best players from the participating embassies and banks were awarded. In addition, tournament partners were honoured for their support in helping make the tournaments a success, including the Ministry of Foreign Affairs, the Qatar Football Association, the Qatar Central Bank and local media. Al Naimi concluded by thanking everyone who contributed to the success of these tournaments, mainly the Ministry of Foreign Affairs, the Qatar Central Bank, the Qatar Football Association, participating banks, embassies and local media. Mr. Al Shaabi concluded by announcing that Qatar Central Bank has committed to sponsor the next edition of the Aspire Banks League in cooperation with AZF. Qatar Central Bank won the Aspire Banks League title during the last tournament, which witnessed the participation of 14 banks, including Qatar Central Bank, Qatar National Bank, Qatar Islamic Bank, Masraf Al Rayyan, Barwa Bank, Qatar Islamic International Bank, Al Ahli Bank, International Bank Of Qatar, Al-Khaliji Bank, Qatar Development Bank, Commercial Bank, Doha Bank, HSBC, and Standard Charted. The embassy of the United Arab Emirates took the title of the Aspire Embassies Tournament, which saw the participation of 18 embassies including Saudi Arabia, the United Arab Emirates, Kuwait, Jordan, Syria, France, Portugal, Sri Lanka, Somalia, Russia, Spain, Mexico, the United States, Algeria, Tunisia, India, Ethiopia and Kenya. 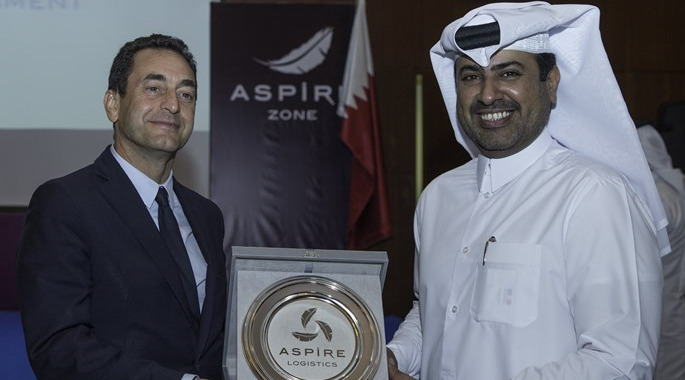 Aspire Zone Foundation (AZF) held a gala dinner to honour the organisations that participated in and supported the Aspire Banks League and the Aspire Embassies Football Tournament, which were held over the past four months. The dinner took place on 9 March and was attended by ambassadors, bank executives, players, local media representatives and officials from AZF.